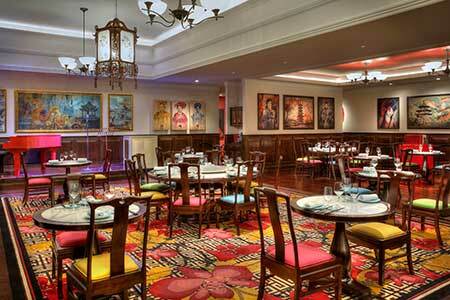 Cantonese, Sichuan, Shanghai and Beijing dishes highlight the expansive menu at this MGM Grand restaurant. : Hong Kong-based Lai Sun Group is behind China Tang at MGM Grand. Décor evokes 1930s Shanghai glamour, with inspiration from Art Deco nostalgia and artwork from around the world. Serving Cantonese, Sichuan, Shanghai and Beijing dishes, the expansive menu includes steamed pork xiao long bao dumpling soup filled with broth and pork with a tangy black vinegar sauce; traditional Beijing roasted duck, roasted for more than 24 hours in an imported duck oven; baked hammer chicken stuffed with mushrooms, pork belly, ginger, shallot and garlic doused in rosé wine and lit ablaze tableside as the server uses a hammer to crack the clay open; and braised Chilean sea bass and roasted pork belly stir-fried together and stewed in double-boiled meat broth with Shaoxing wine, dark soy sauce and oyster sauce.